The island continent that existed where the Atlantic Ocean now is and that sank in cataclysm (the Flood of Noah) approximately 11,600 years ago as calculated by James Churchward. Vividly depicted by Plato; ‘seen’ and described by Edgar Cayce in his readings; recalled in scenes from Taylor Caldwell’s Romance of Atlantis; scientifically explored and authenticated by the late German scientist Otto Muck, who fixed the time and date of her destruction (by an asteroid that plunged into the Bermuda Triangle with the force of 30,000 hydrogen bombs) at 8 p.m. June 5, 8498 B.C.! In his dialogues Timaeus and Critias, Plato recounts that on “the island of Atlantis there was a great and wonderful empire” that ruled Africa as far as Egypt, Europe as far as Italy, and “parts of the continent” (thought to be a reference to America, specifically Central America, Peru, and the Valley of the Mississippi). It has been postulated that Atlantis and the small islands to its east and west formed a continuous bridge of land from America to Europe and Africa. W. Scott-Elliot’s Story of Atlantis presents the records of Atlantean civilization as revealed by clairvoyance. 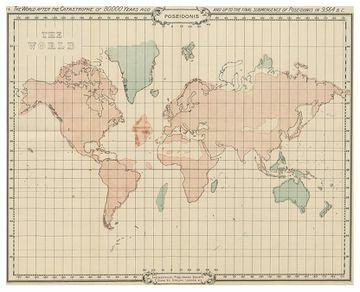 Scott-Elliot’s book is a compilation of the discoveries of a number of students who, according to Theosophist A. P. Sinnett, were “allowed access to some maps and other records ... from the remote periods concerned” to promote the success of their work. These maps, he says, had been physically preserved by those other than the races presently occupying Europe—presumably by the Adepts who tutored students of Theosophy, although Sinnett does not specify. Scott-Elliot writes that the continent was destroyed in stages, with cataclysm occurring 800,000, 200,000 and 80,000 years ago, with the last remnant of Atlantis being the continent-island Poseidonis, located near the Azores, which in 9564 B.C. was submerged in a catastrophe referred to in many ancient writings, including those of Plato. 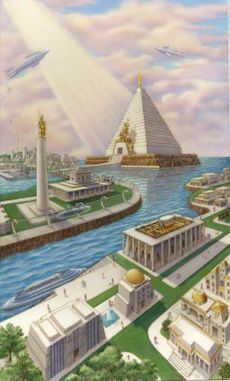 The ascended masters have revealed that Jesus reigned as emperor and high priest over a golden-age civilization on Atlantis that lasted two thousand years, from 34,550 B.C. until 32,550 B.C. This age was seventeen ages previous to our own, and it was under the sign of Cancer. Jesus was born in 33,050 B.C. and began his reign in 33,000 B.C. after the golden age had been in progress for over 1,500 years. His consort was his twin flame, whom we know as the ascended lady master Magda. They ruled because they were the highest representatives of God in embodiment in that civilization. All the people of this civilization knew and accepted God’s will. Jesus and Magda did not have to impose any rules on the people because they were all in attunement with their Divine Source. However, after Jesus had reigned for 450 years, the seeds of corruption were sown by one called Xenos, who was chief counsellor to the emperor. Finally Xenos convinced the people to revolt against the government (personified in Jesus) because the government was supposedly not supporting them. Xenos took over as leader of the government. Jesus Christ, Magda and two million loyal subjects (20 percent of the people) went to the land that later was to become Suern—India including Arabia. Half of them made their ascension at that time; the other half have continued to evolve on earth until today. On Atlantis, the once golden-age civilization gradually descended into barbarism as the people, imperceptibly to themselves, grew dense and insensitive to life. Looting and anarchy prevailed to the point where even Xenos lost control. Over time the cities disappeared and crumbled. Barbarism reigned on Atlantis from 30,000 B.C. to 16,000 B.C., when the great civilization of Poseid arose. About 15,000 B.C., Jesus returned as the ruler, the Rai, of Atlantis. As described by Phylos the Tibetan in his book A Dweller on Two Planets, this great Rai appeared in the Temple of the capital, Caiphul, and caused to spring up there the Maxin, the Fire of Incal. This unfed flame burned on the altar of the temple for five thousand years. The Rai of the Maxin Light ruled for 434 days. He revised the laws and provided a legal code that governed Atlantis for thousands of years to come. After a long golden age, the civilization of Atlantis was corrupted by false priests, until “God saw that the wickedness of man was great in the earth, and that every imagination of the thoughts of his heart was only evil continually.” The last remnant of Atlantis went down in the great cataclysm that is recorded in the Bible as the Flood of Noah. H. P. Blavatsky, The Secret Doctrine (London: Theosophical Publishing Co., 1888), Vol. II, see index for the many references to and descriptions of Atlantis. Edgar Cayce, Atlantis (Virginia Beach: A.R.E. Press, 2014). W. Scott-Elliot, Legends of Atlantis and Lost Lemuria (Wheaton: Theosophical Publishing House [Quest Books], 1925, 1990), pp. 3–89. Phylos the Tibetan, A Dweller on Two Planets (Borden, 1952). James Churchward, The Lost Continent of Mu (1931; reprint, New York: Paperback Library Edition, 1968), p. 226. Otto Muck, The Secret of Atlantis (New York: Pocket Books, 1979). Ignatius Donnelly, Atlantis: The Antediluvian World (New York: Dover Publications, 1976), pp. 11, 23, 173, 473. Lectures on Atlantis delivered by Elizabeth Clare Prophet, based on the teachings of the ascended masters and A Dweller on Two Planets, by Phylos the Tibetan, are available from www.AscendedMasterLibrary.org. Mark L. Prophet and Elizabeth Clare Prophet, The Masters and Their Retreats. This page was last modified on 25 July 2016, at 17:57.